I’ve heard a lot of bad things about Manila before I came there: how Manila is crowded as hell, how Manila is so messy, how Manila is so full of traffic jam – the point is how you should not spend too much time in Manila because there’s nothing good in this city for you to enjoy. But hey, visiting a country without exploring the capital city isn’t complete, right? 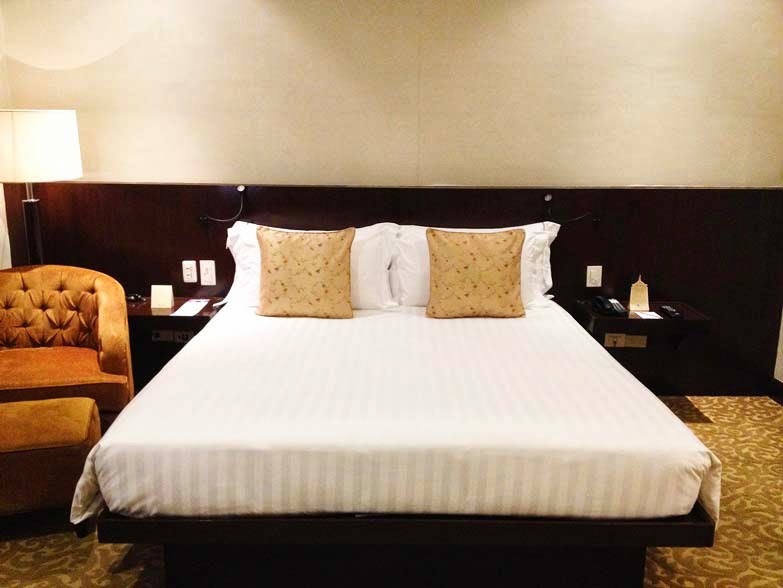 So when I and Timothy, were planning our trip and accommodation in Manila, we knew that one of the ways to make our stay better was to pick the best hotel in Manila. 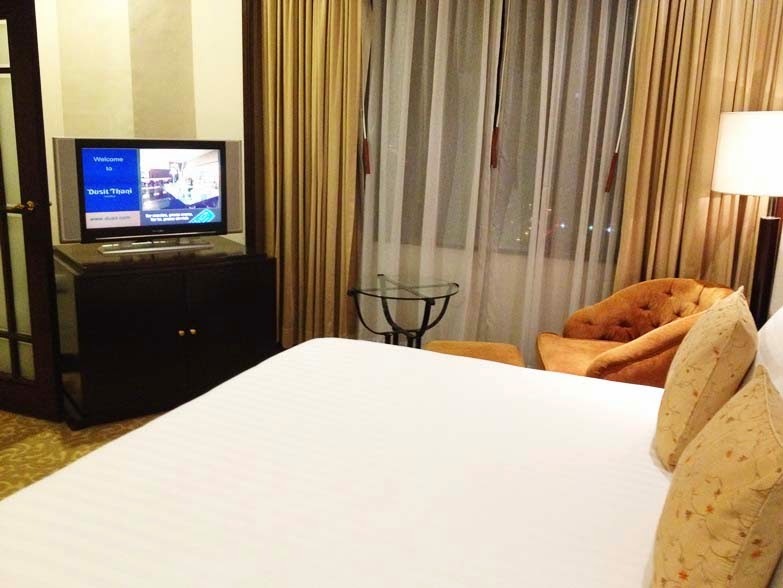 And our choice fell into Dusit Thani Manila, located in the Makati area, the business district of Manila. 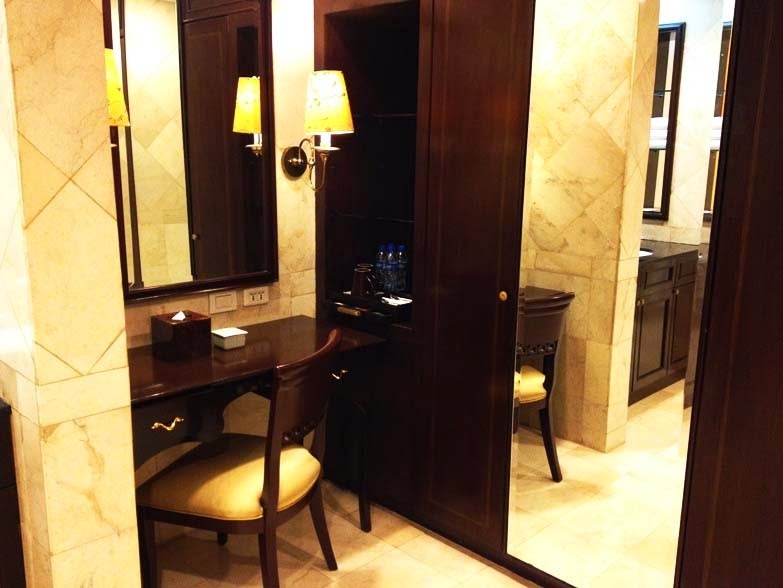 Dusit Thani Manila is located approximately 10 minute drive from the airport (using taxi will cost you around 110 php). Next to the hotel was a complex of malls that were connecting between one another. They have SM Mall (one of the taxi driver there said that SM Mall is the national mall, lol), Glorietta and Greenbelt 1 to Greenbelt 5 – it was like you’re heading to one place but you got 7 places at the same time, lol! 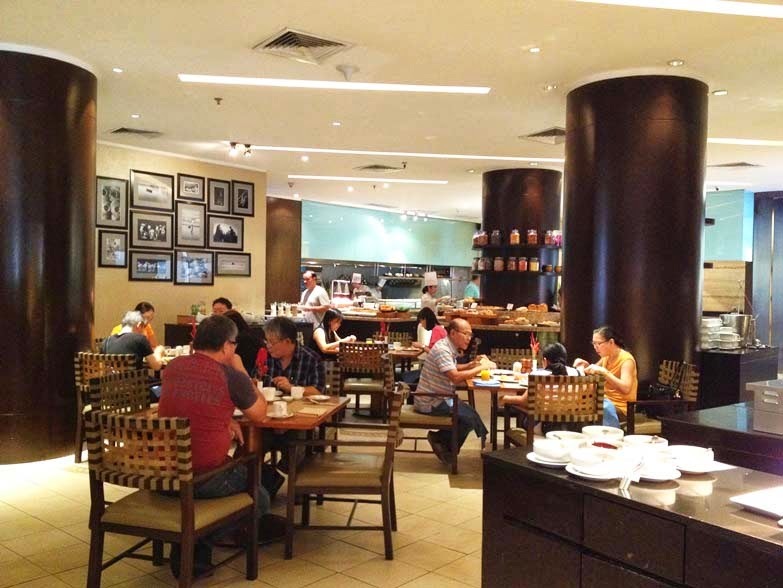 When we stepped in our feet at the hotel lobby, we knew we made the right decision by choosing Dusit Thani Manila. We were greeted with “Sir” and “Ma’am”, accompanied by one of the best smiles we’ve ever seen and they were super friendly as well! 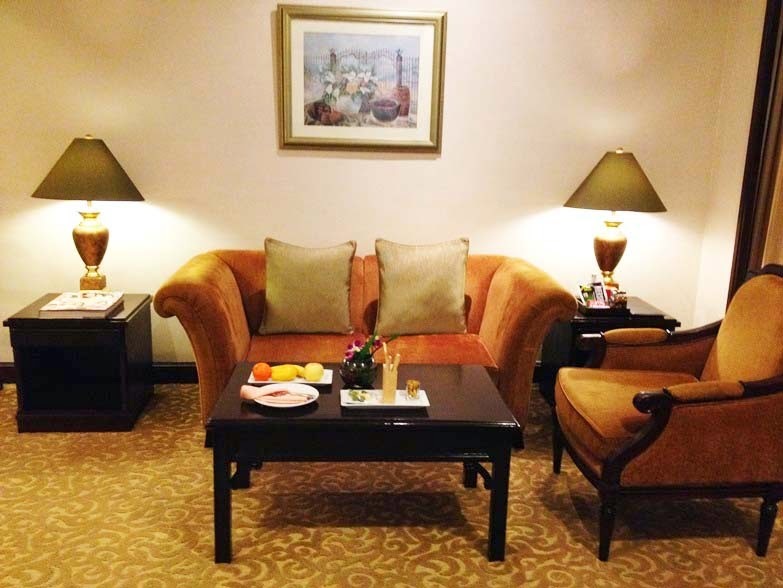 Dusit Thani Manila has several room types: Deluxe, Junior Suite, Executive Suite, Club Deluxe, Club Executive Suite, Ambassador Suite and Presidential Suite. 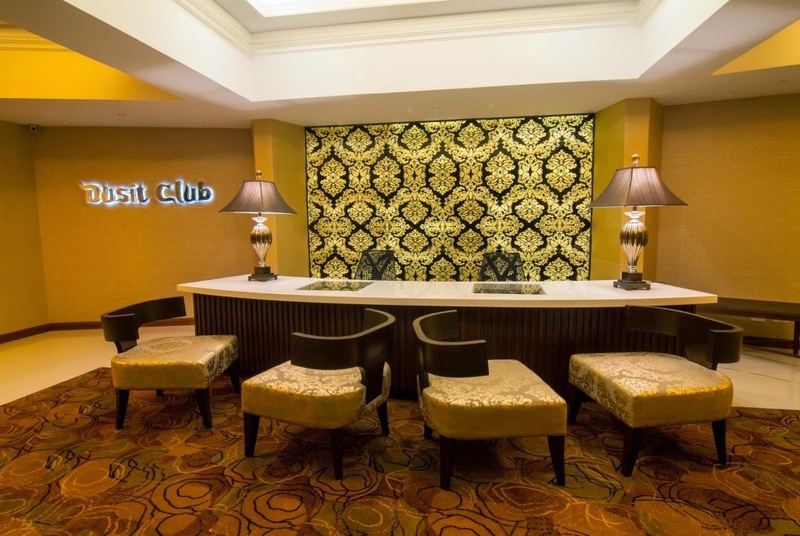 Their Club Deluxe, Club Executive Suite, Ambassador Suite and Presidential Suite are considered as the “Club Floors” guests that are deserved to get an exclusive access to their Club Lounge and enjoy its privileges. 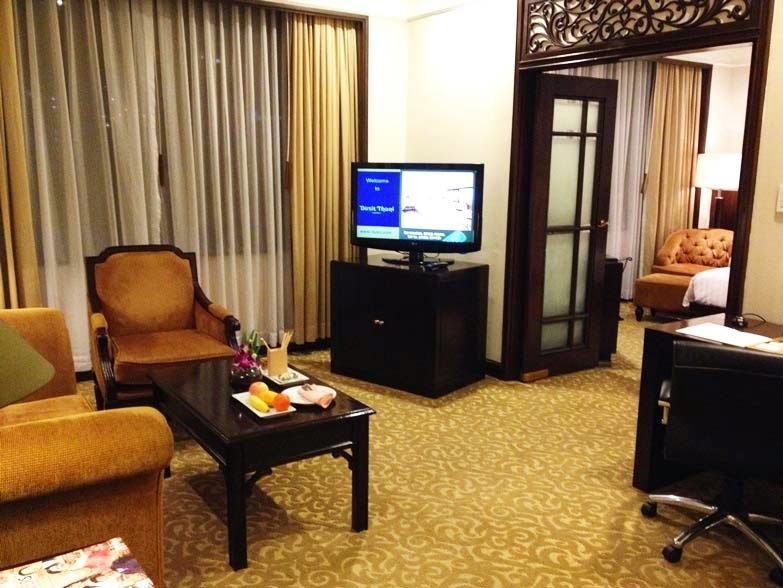 And our room, the Club Executive Suite, is one of them. 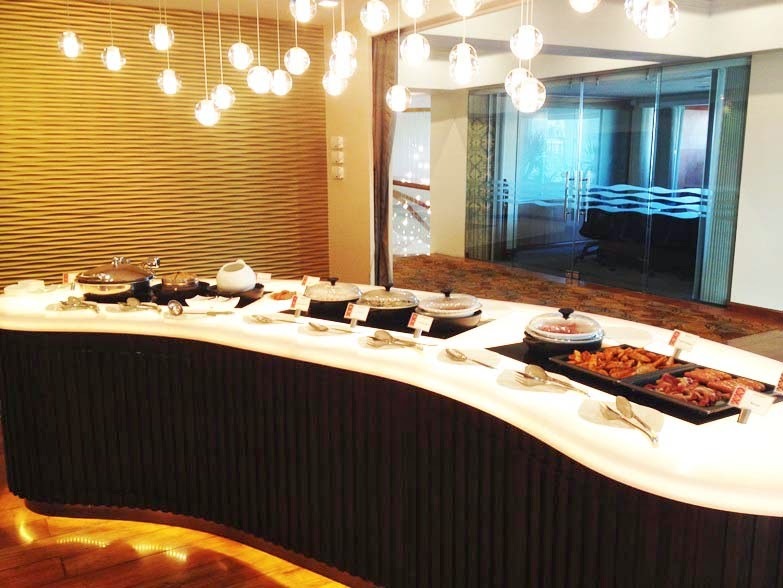 Dusit Club Lounge is a 900-square meter room that sits on the 17th floor of Dusit Thani Manila, where you can enjoy a seemingly 360 degrees view of the city. 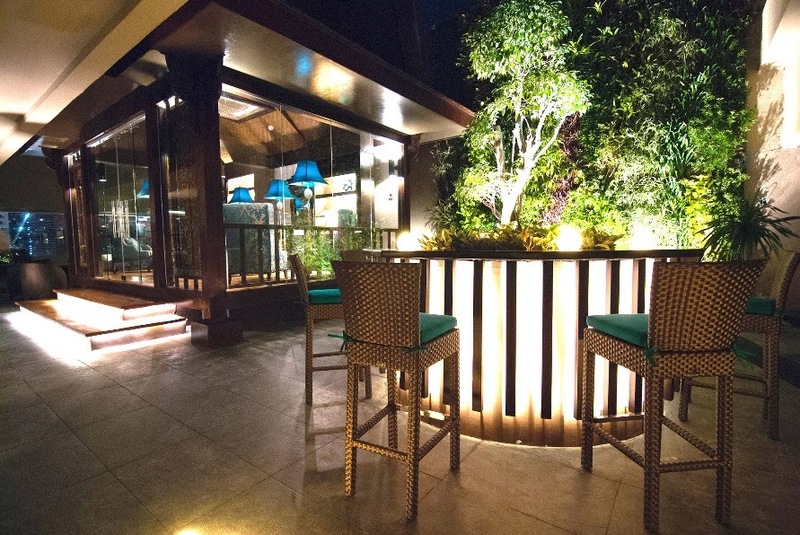 It is a more private and exclusive facility that is provided only for the Club Floor residents and opens from 6am to 11pm. It gives you a priority check-in and check-out facility, unlimited broadband and internet use throughout the hotel (including your room), complimentary all-day snacks and refreshments (you can have your breakfast here too if you want), evening cocktails and canapes, and many other thing that will exceeds your expectation when you’re staying in a hotel. But it’s more than that. 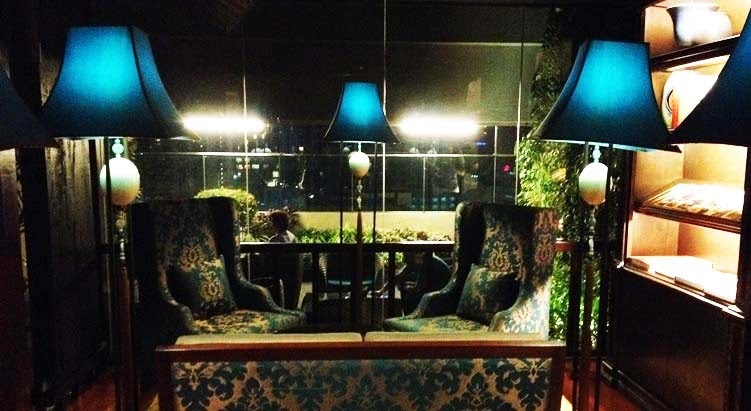 The Dusit Club Lounge also provided you with a reading room that they called as Pavilion, an outdoor area which is surrounded by rooftop tropical gardens, and even a meditation room that they called the Silence Room. 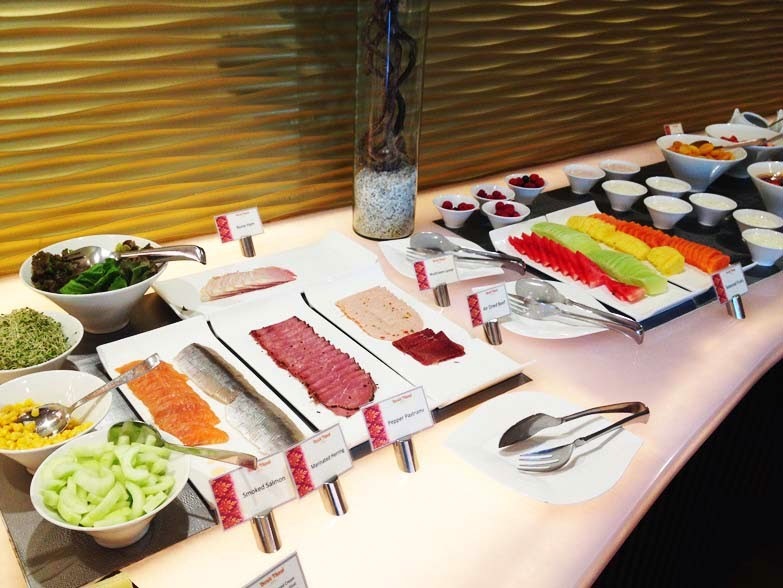 Breakfast selection at Dusit Club Lounge - each menu has its individual heater below to keep the food warm all the time. Their corned beef is the best! 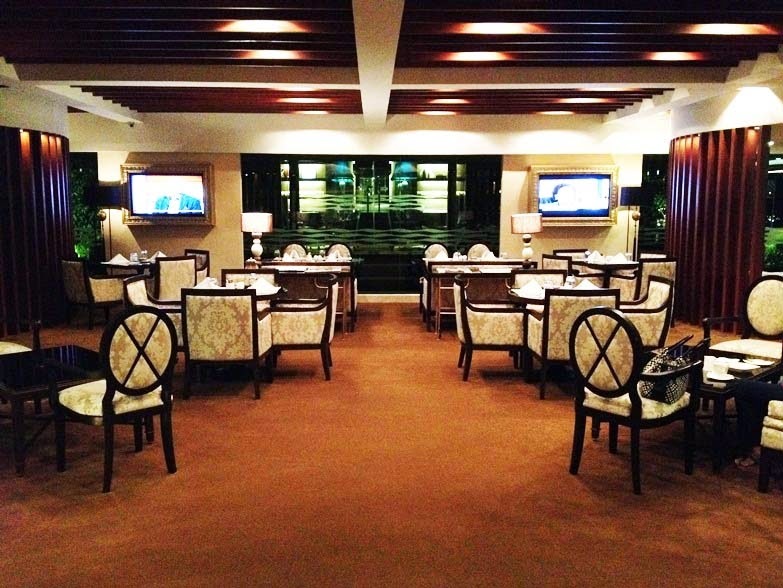 Trivia: Dusit Thani Manila has the biggest Club Lounge in Manila and it is only a year old when we were there. Now, you must be wondering, with those benefits, what kind of room did I get? Well, prepare yourself to be amazed, because I was amazed too when I entered the room! They have 2 TV in one room! The Club Executive Suites toiletries are from L'Occitane! It’s a 73 square meters room that consists of a living room, a bedroom, and a super-whoa bathroom! 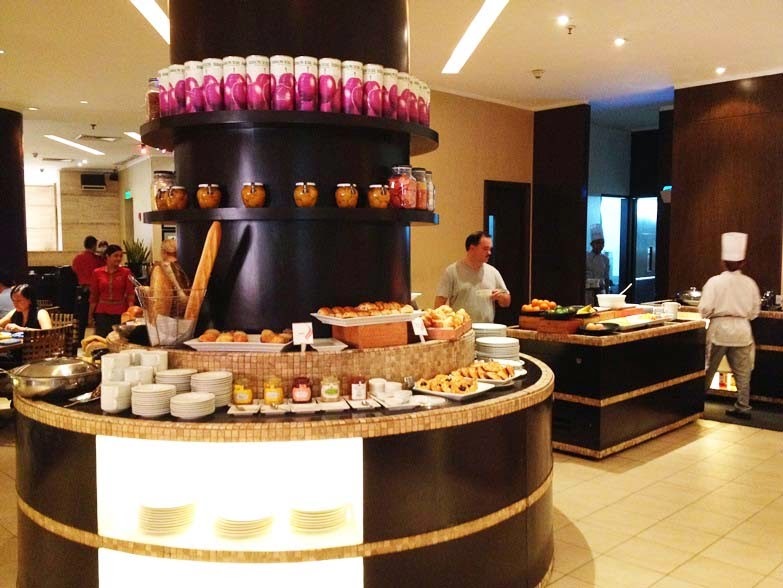 They prepared fresh fruits and snacks for you! And from them, I knew that cheese and olives are so good together! 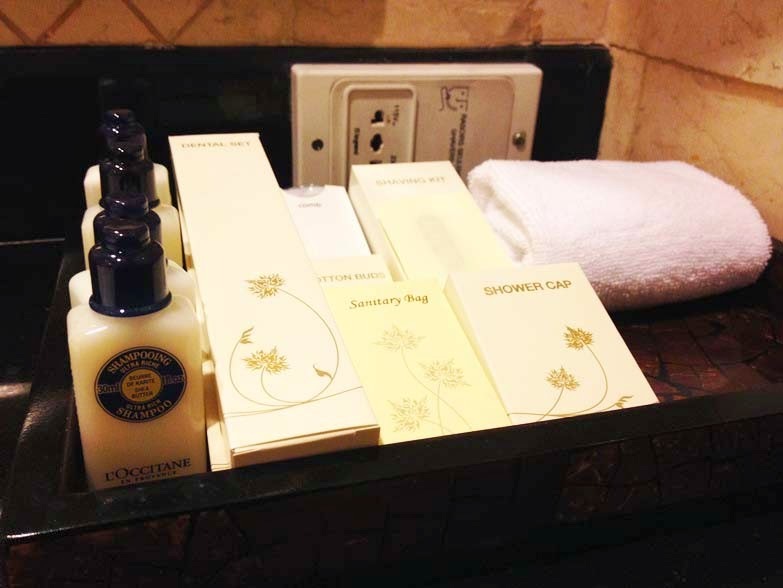 Their Club Executive Suite toiletries are from L’Occitane! Wow! They provide your bathtub-bubbly time materials too – the bathing salt and even the aromatherapy and candles! 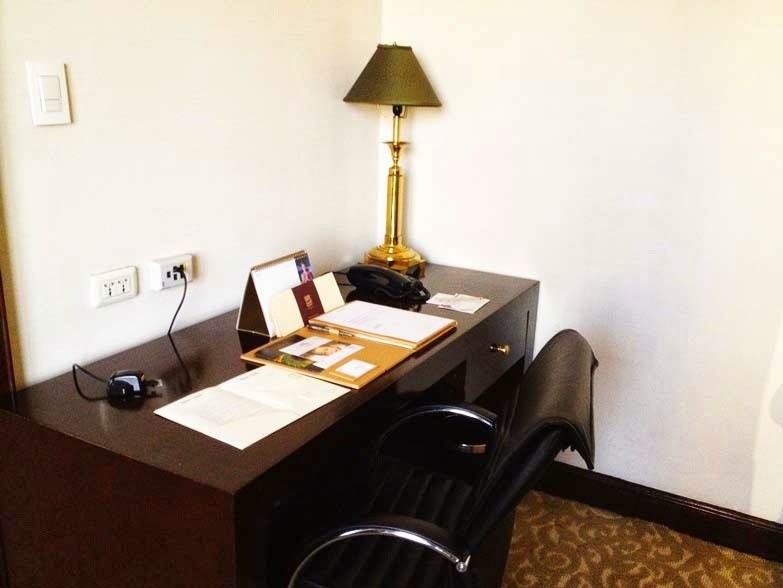 The housekeeping service cleans the room more than once a day – OMG! I was really surprised (and super impressed) that when I first got back to my room around 4pm, the room was cleaned already. Then I went out and came back again around 10pm and the room was cleaned… again! Whoa! 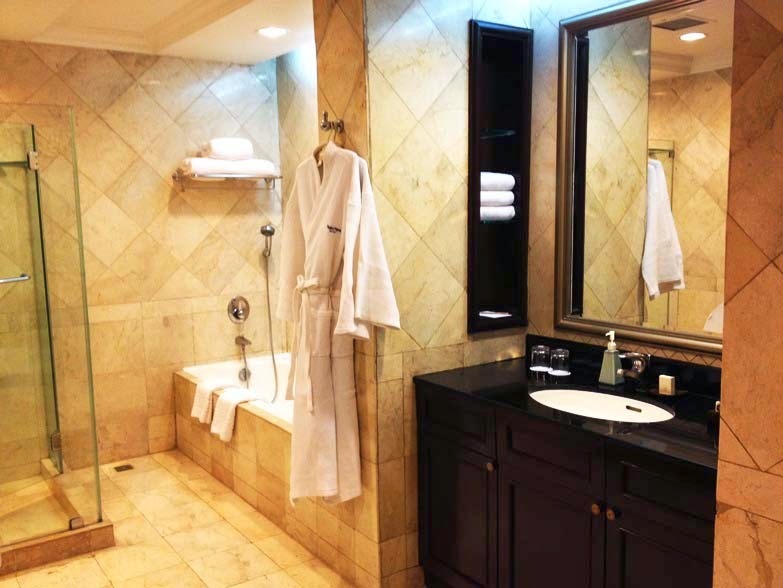 You know, bathroom cleanliness is one of the most important element a hotel must have, and for me, Dusit Thani Manila won this part big time. Those are the most outstanding things I found in my room, but the other thing that I had in the room was impressive too! The bed are super comfy, they provided what women need: a dressing table with comfy chairs complete with a big and beautiful mirror and a hair dryer that makes you (women) feels like home. 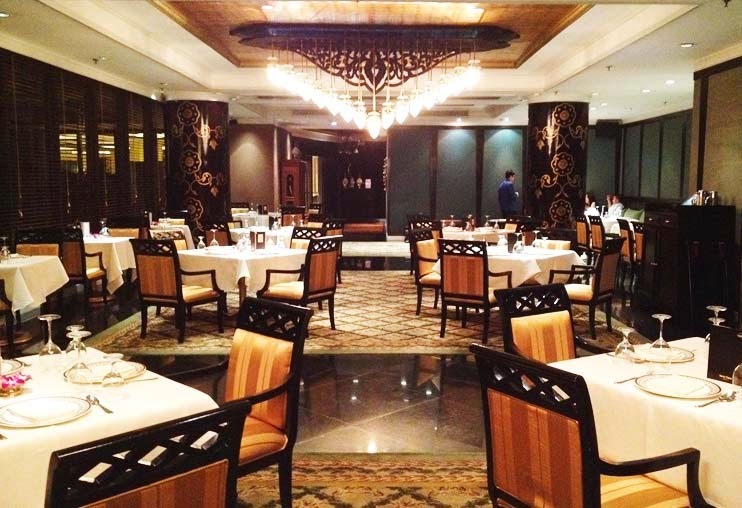 Dusit Thani Manila has 4 restaurants inside the hotel: Basix, Benjarong, Tosca and Umu. 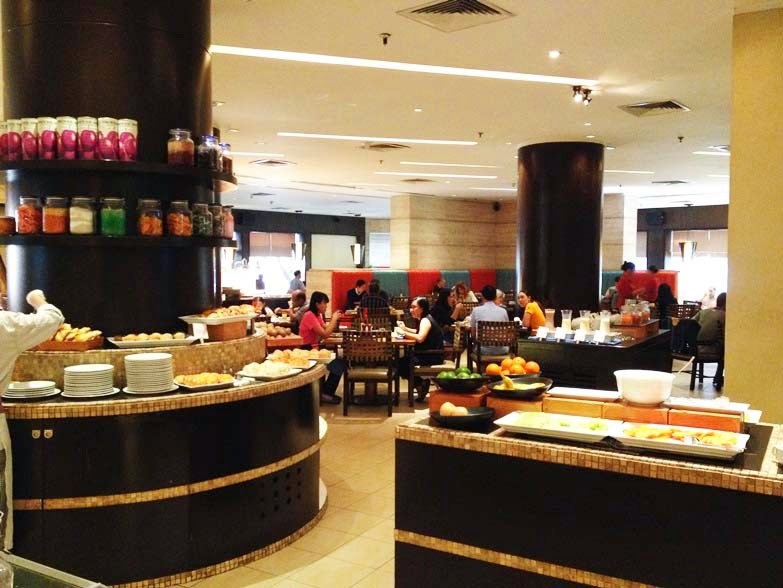 Basix is the buffet restaurant which also becomes the common breakfast place – but you can also have your lunch and dinner there too. 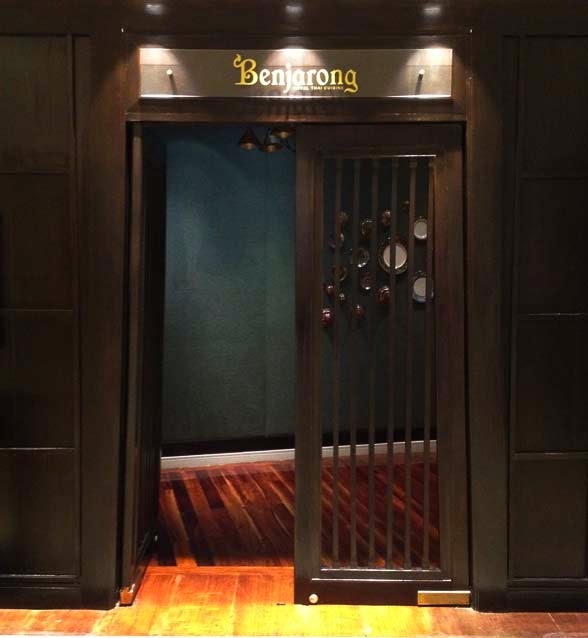 Benjarong is the restaurant that serves the hotel’s home cuisine, which is Thai cuisine. Tosca is the Italian restaurant, while Umu provides Japanese food. During our two nights stay there, we got to try two restaurants, Basix for our breakfast and Benjarong, the Thai restaurant for the dinner on our first night there. 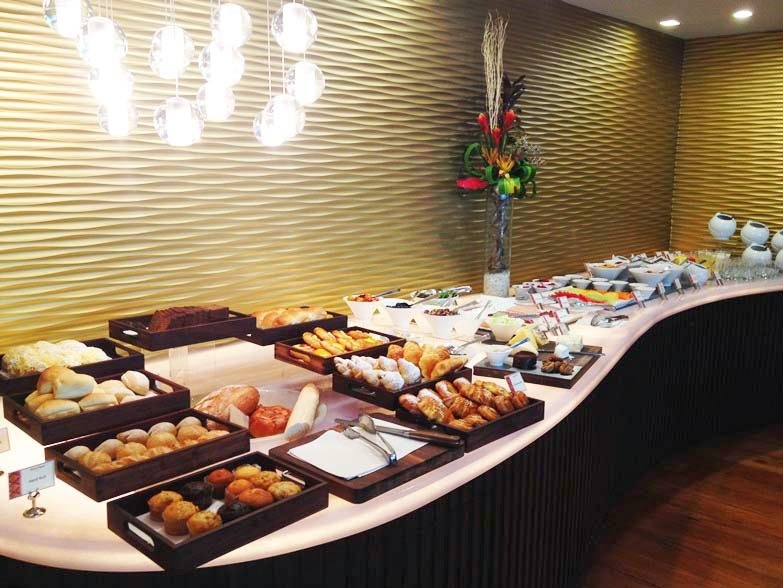 For a breakfast place, Basix provides a wide range of food, from traditional Filipino dishes, Indian food, Asian delicacies, and even an American-style breakfast. 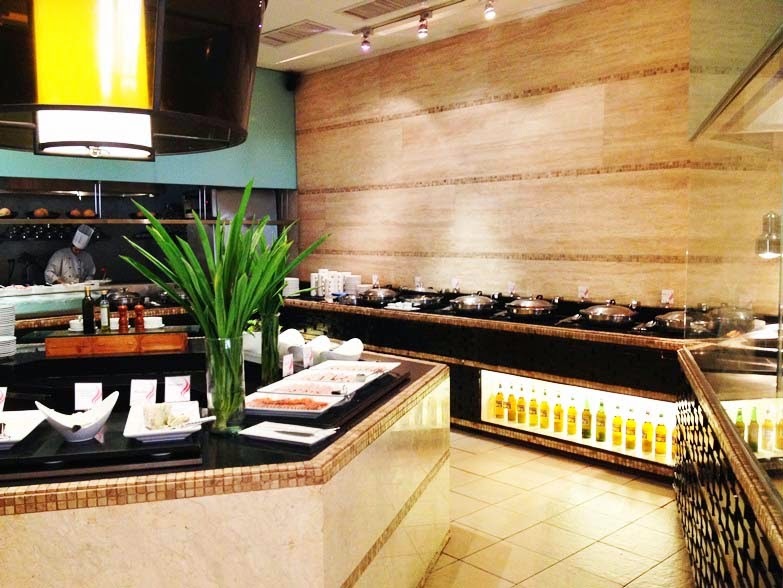 It gives you the opportunity to try the food to your likings. 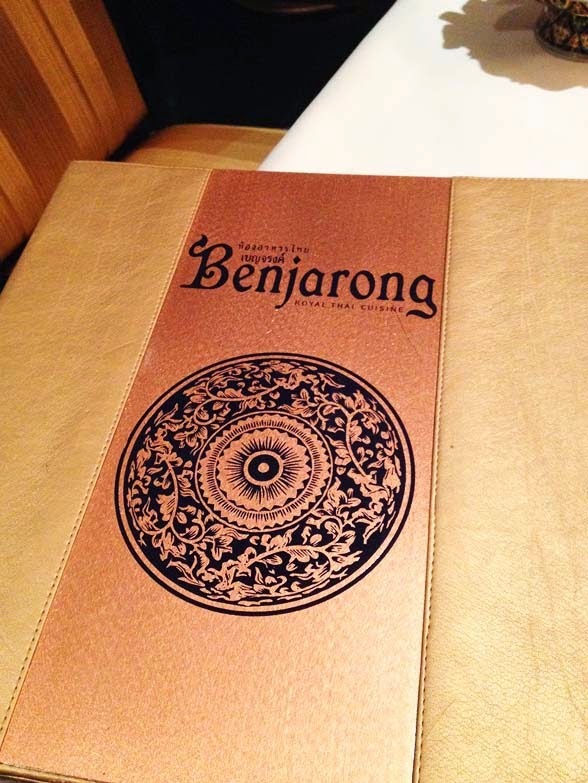 We also tried Benjarong for our dinner and the way Benjarong cook their food made me love Thai cuisine! 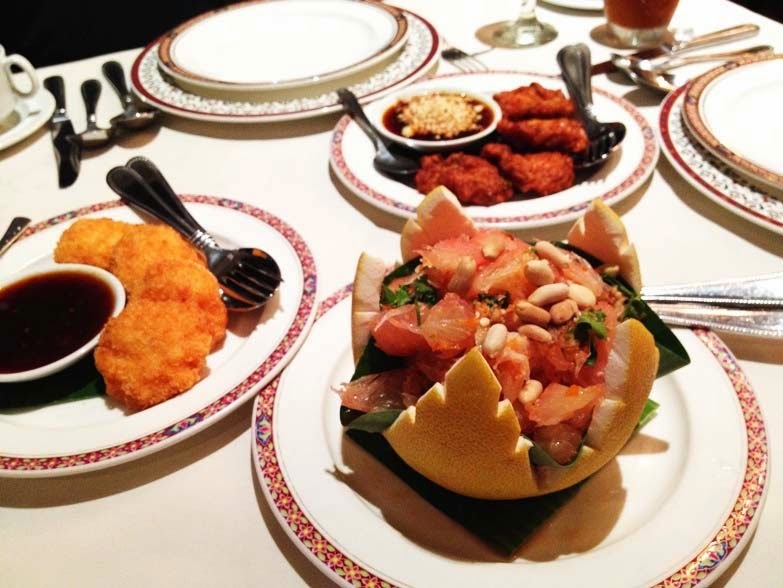 They serve a very authentic Thai food because the chef is from Thailand, the ingredients are imported from Thailand and the atmosphere and decorations are so Thai too! 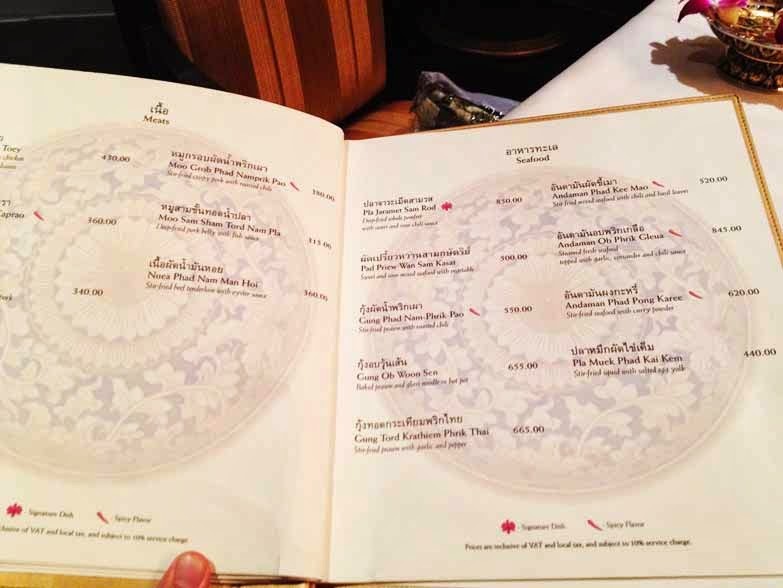 That night, we ordered 7 menus plus two desserts. 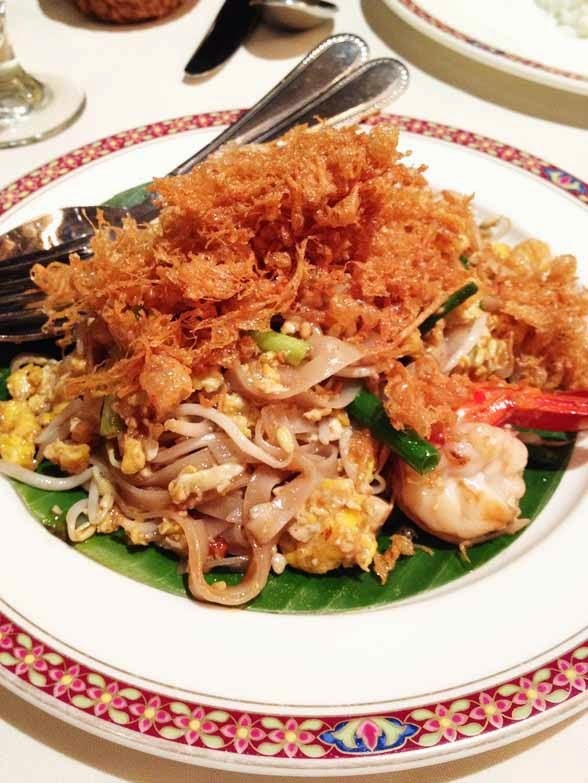 It all started with a Tom Yum Gung. 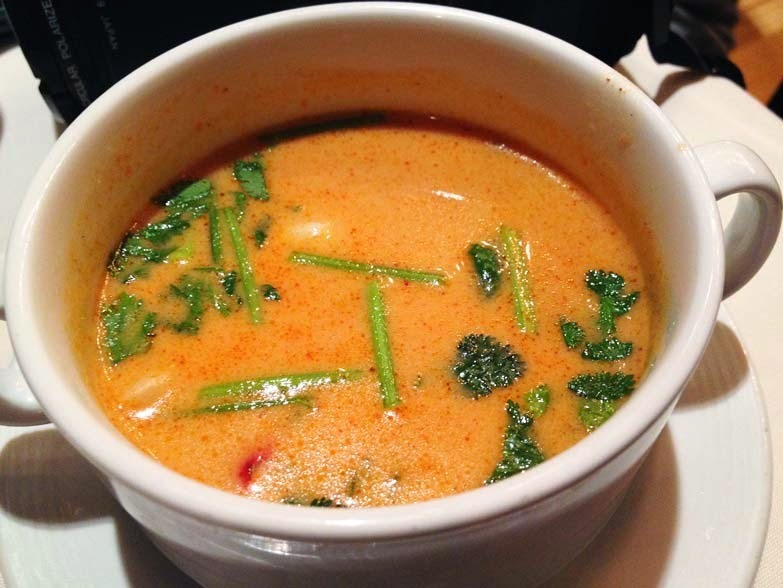 Love love love the Tom Yum Gung so much! The taste and color are different from the ones that we have here in Indonesia. I never liked Indonesia’s Tom Yum Gung but I love Benjarong’s Tom Yum Gung so much! Then our food party continued with Fish Cake, Shrimp Cake, Pomelo Salad, Pad Thai, some beef cooking (I truly forgot the name, sorry) and a pot of Red Curry Duck which I love the most (aside from the Tom Yum Gung). 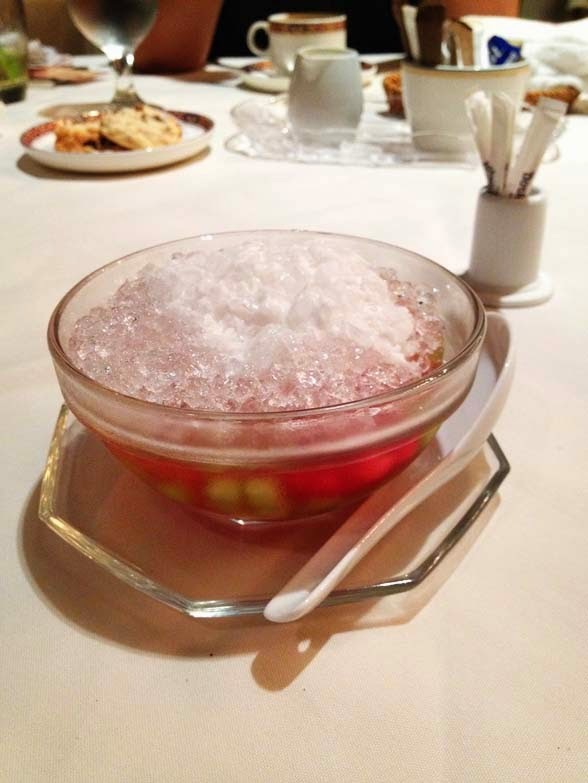 Then, we end our food fiesta with a Thai’s Halo-Halo (a traditional Filipino dessert but it is a Thai version), a full tummy, a happy face and a good night sleep. 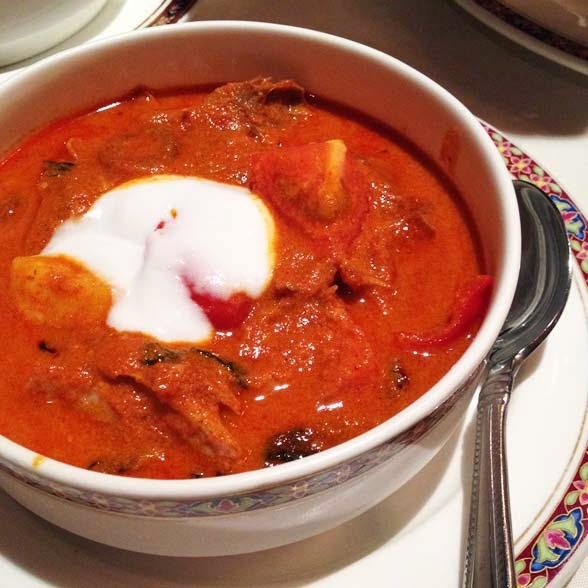 Red Curry Duck - yumm! 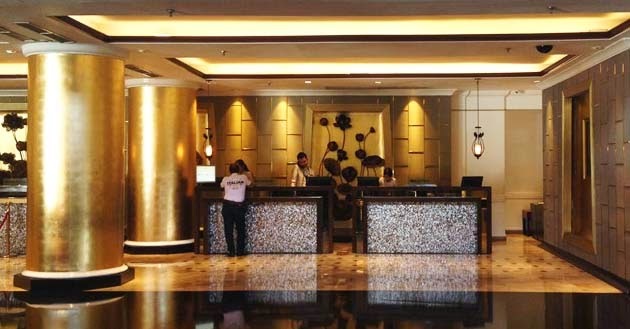 Well, I’m pretty sure that our impression with Manila wouldn’t be the same if we didn’t stay at Dusit Thani Manila and experienced the staffs’ friendliness and hospitality. So, big thanks to Dusit Thani Manila, our short stay in Manila was as sweet as their staff’s smile – and I assure you, their smile is one of the sweetest smile you could find anywhere in the world! This post is a series post for my and Timothy’s trip to The Philippines, Malaysia and Singapore. 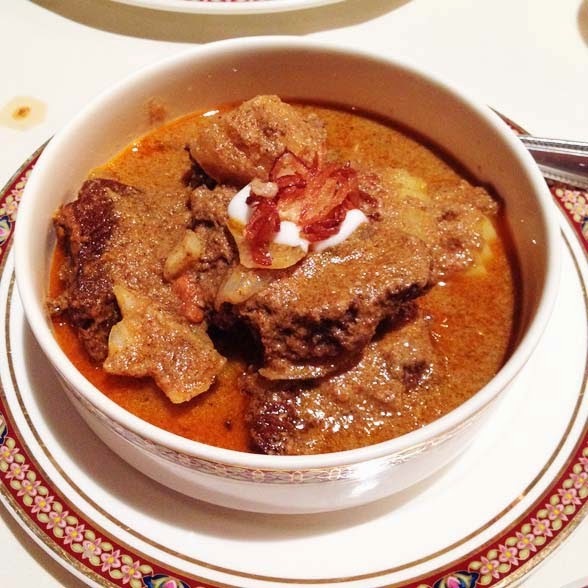 You can read his thoughts on Dusit Thani Manila here. 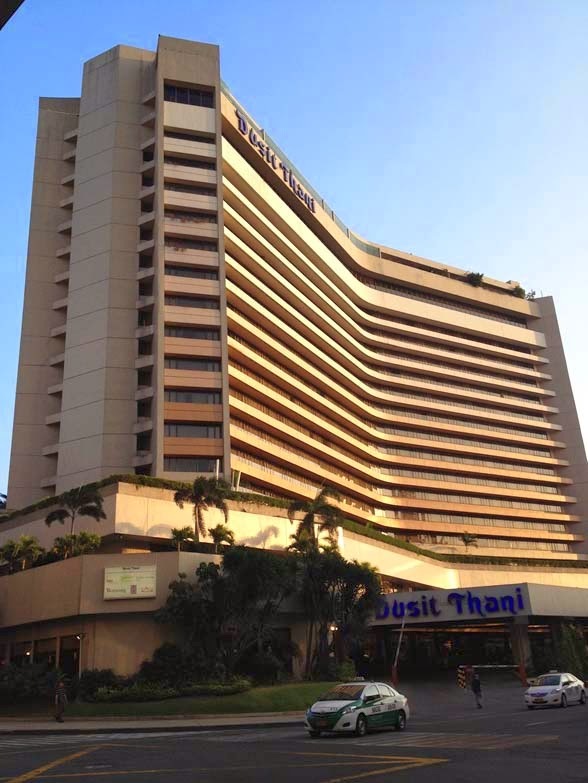 Dusit Thani Manila is one of our partners during this wonderful trip. 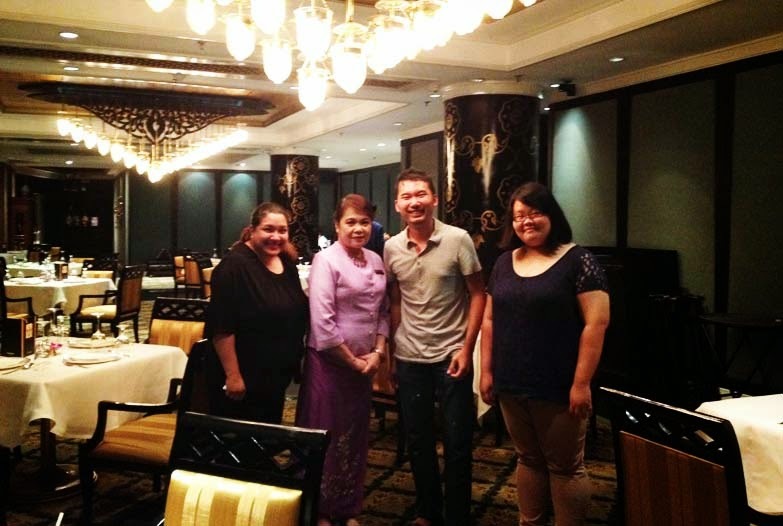 A huge thanks to Lizel and Shariza from Dusit Thani Manila for being a very nice host! 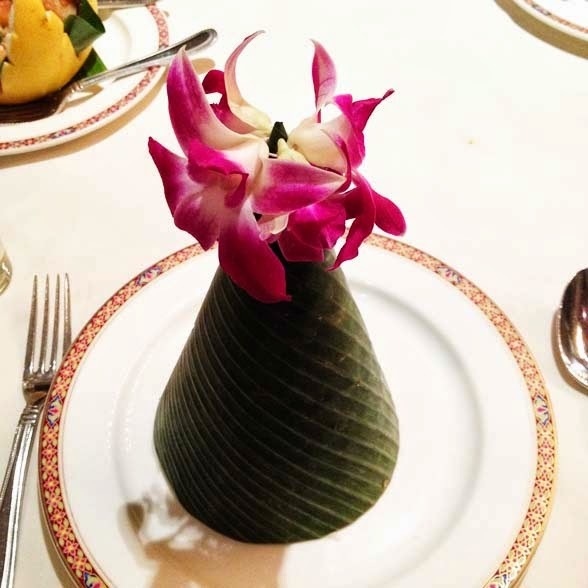 I was a guest of Dusit Thani Manila and all opinions are my own.